Mitsubishi Motor Corporation is a Japanese Automaker known for its quality and craftsmanship. The company is manufacturing cars since 1917. 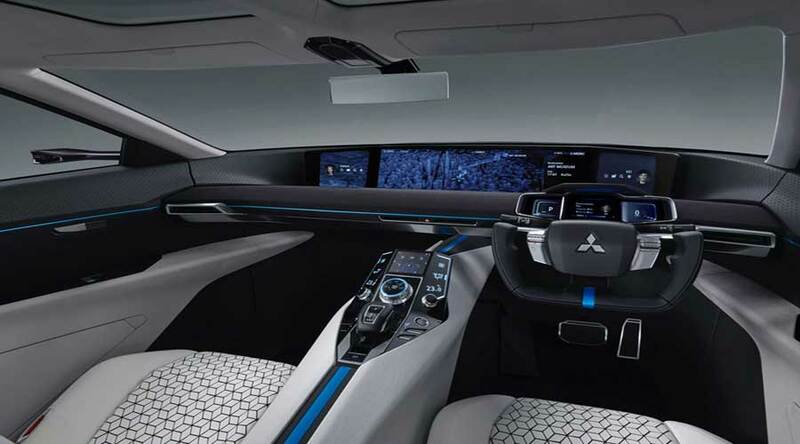 The Mitsubishi e-Evolution concept car showcases company’s future directions and strategy. The e-Evolution concept is a combination of the SUV and EV. It also features the new ecosystem of connected cars and customer experience. The SUV itself reflects the direction of company’s future strategy in the coming era of electric cars. In addition, the company is strongly focussing on its tagline ‘Drive your ambition’. The Mitsubishi e-Evolution concept highlights company’s goals of long-term sustainable growth strategy. The rise in emission problems leads to more clean and efficient vehicles for emission-free cities. Year by year, regulators are enforcing stricter norms on emission. So, the electric cars have no alternative. The company is building the future strategy on all-electric vehicles that meet emission standard and are more efficient. The Mitsubishi strongly focused on the robustness while designing the e-Evolution concept. The company has created distinctive features. The modern functional design gives the SUV more strength and authenticity. The robustness of the vehicle highlights in every angle. The e-Evolution concept is agile and holds tight on the road surface which makes it the most agile high-performance tourer. Its off-road capabilities along with the 4-WD deliver a top-notch performance. The design expresses e-Evolutions ability to hold on the ground without losing traction. The muscular styling of the corners gives bold and aggressive looks. The side view emphasizes on the SUV personality. The horizontal character lines with high ground clearance give the car the ability to drive on the off-road terrains. The front design of the e-Evolution comes from Mitsubishis Dynamic Shield design. The grille is shielded under glass. The large air inlets beneath headlamps direct the air to the brake calipers to cool them down. So, you can easily make out the presence of a high-performance electric vehicle by just looking at the exteriors. Furthermore, the short overhangs highlight the nimbleness and agility of the car. The most noteworthy exterior feature is the deep slant of the front windshield. The short overhangs along with the slope create a unique silhouette generally found only in the EVs. The rear Hexagon shape of exteriors finds their inheritance from the legendary Mitsubishi Pajero. This particular shape is iconic and has a strong correlation with Mitsubishi Brand at large. The C-pillar directly symbolizes the tail-fin of the jet. The diffuser and air intake running across the Cc-pillar to the rear bumper improve aerodynamics. The internal combustion engine is absent in all-electric cars. The particular absence of the engine creates more opportunity for designers. As a result, the designers simply change the interiors radically with more space. The traditional styling of horizontal dashboard continues in new e-Evolution. The traditional dashboard displays all the information above the axis while all operations are below the axis. The horizontal instrument panel also helps to analyze information On-The-Go. In addition, it doesn’t distract you from driving. The large screen spans end to end. It displays the information such as navigation, outside information, and coaching information. The two smaller screens sitting next to large screen display the views from the front and rear cameras. The camera view looking at the front tire helps in maneuvering in tight situations. Furthermore, the full-glass windows allow a 360-degree, obstruction free viewing angle. Hence, the high visibility increases safety. EV system: The batteries located in the floor provide low canter of gravity and precise stability. The high capacity electric motors along with high performing batteries give the powerful and robust performance. 4WD system: The triple motor 4WD system consists of a single motor at the front and two motors at the rear. The active torque vectoring called Active Yaw Control (AYC) control the dual motors at the rear. Mitsubishi combined all this into one system called Super All-Wheel control. (S-AWC). S-AWC provides dynamic control to the vehicle. As a result, cornering and traction performance improves. The electronic brake calipers help to optimize brake performance. The combined effect of all these systems results in nimble and crisp handling on any terrain. AI system: The AI system runs actively in the Mitsubishi e-Evolution concept. The AI understands the changing road and surrounding conditions as well as driver actions. The AI coordinates between driver and vehicle seamlessly. As a result, the driver can control the vehicle easily and effortlessly. The AI system is also designed at all new level. The system offers the coaching function. In this function, AI transfers all the driving knowledge to the driver enhancing driver’s abilities and skill levels. The system constructs a data-set in accordance with current driver performance. Once the system creates the data-set, it creates a learning program to train driver through voice instructions. It also creates a dialogue with the driver by displaying a relevant skill set on front display. Furthermore, the relevant information helps the driver to achieve the required skill. As a result, the car behaves just as the driver wants it to behave. So, the driver can enjoy the driving experience to a greater level. In conclusion, The AI-powered Mitsubishi e-Evolution is changing the way driver learns the driving. At the same time, it provides more safety and comfort in all terrains. Monowheel motorcycle ‘Warhorse’: One wheeled wonder! Smart vision EQ Fortwo: How this small concept car will change the way you travel?